Home to the University of Iowa, Iowa City was perhaps fittingly, the original Capital of the state. The University is now home to the original Capitol building. The University is acclaimed, offering some of the highest quality education available from a public institution. In addition to providing world-class education, the University is also recognized for its Hospital, the University of Iowa Hospitals and Clinics. The University of Iowa currently enrolls in excess of 22,000 students every year. In addition to being known for its hospital and academic programs, UI also has a Division I, Big Ten athletics program. The Hawkeyes are competitive across a wide range of sports. The Hawkeyes have produced a number of world-class athletes, including NFL hall-of-famer Andre Tippet. Iowa City is a college town, and that means that you have to consider the student population when deciding when the best time to try and rent an apartment is. This means that you have a window between May and July when the best apartments become available. If you don't find a place by August though, you will notice students who left their search until the last minute snapping up everything in sight. When you meet with a landlord in Iowa City, think about the type of image that you're projecting. They will notice much more than the information that you put down on your application. They'll notice things like if your music is blaring when you pull up to the house, or if you're dressed in a professional manner. Each little detail helps build their image of you, and you want them to see you as responsible and trustworthy. Iowa City residents have extremely affordable access to public transportation. Both the city and the University provide busses that transport people across Iowa City and the University of Iowa. The university's service is completely free, and the city's costs only $1. That said, if you're downtown, the University and many stores and services are all within easy walking distance of each other. The aforementioned original Capitol building is now known as the Old Capitol Museum. There are also Art and Natural History museums on the University grounds. Gabe's Oasis is has the best selection of live music in town. Smaller, local acts and open mic nights can be found at the Mill Restaurant. The entire area around the University is home to a thriving nightlife, thanks to the hoards of college students who can be counted upon to go out any night of the week. The Old Capitol building is an important piece of Iowa history, and worth a visit if it is your first time in the city or if you have any interest in architecture. The University of Iowa has a beautiful campus. It is a great place to tour for those interested in architecture, or if you just want to take a quiet walk. There are six different museums on campus, each of which can be considered an attraction in it's own right. The two most popular are the University of Iowa Museum of Art, and the Museum of Natural History. The gourmet burger movement has certainly reached Iowa City. Short’s Burger & Shine serves fantastic burger-based creations that rival any artisan burger joint from a larger city. Her Soup Kitchen might not have the most creative name in the world, but it has some of the best lunches around. Every city needs a great Italian restaurant or two, and Iowa City certainly succeeds in that regard. Baroncini is well known for it's delicious Italian food. Basta is another excellent option in a similar vein. If you're looking for an elegant place to head out for the evening, Orchard Green has amazing food as well as a top-notch selection of beer and wine to pair with your meals. The Deadwood Tavern is a great place to go in Iowa City if you want to escape the constant onslaught of students that fill most of the local drinking establishments. If you're looking for a quieter, more grown-up place to get a drink, this is a great option. If you're looking for a great college bar where you can watch a game with some friends though, head to the Airliner. If you enjoy the traditional Irish Pub experience, then Micky’s Irish Pub and Grill is one good option. The Dublin Underground is another small Irish pub. While it might be small in size, it makes up for it with a lot of character. Iowa City has a very deep literary tradition. The Literary Walk is a series of panels that reprint the words of several famous authors with ties to the state. The University of Iowa Museum of Art is well regarded for it's large collection of African pieces. There are also several other museums on the University campus, all of which are worth visiting. There is also a professional theatre company in town at the Riverside Theatre. The company performs Shakespeare in the park each summer, and several plays throughout the season that range from the classics to modern work. People in Iowa City spend all year looking forward to the Iowa City Jazz Festival. This great music festival runs at the start of July each year, and has been running for more than 25 years. Another popular festival takes place in June, when the Iowa Arts Festival celebrates the work of local artists. The Mission Creek Festival is a very well regarded, and growing, music festival that features indie bands from across the country. The Landlocked Film Festival provides a great venue in August for independent filmmakers to get their work in front of an audience for the first time. 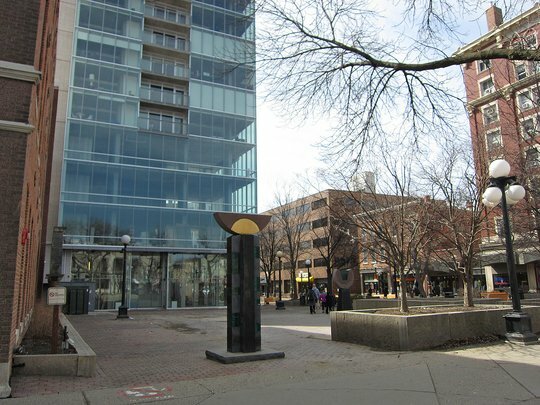 There is a lot of great shopping available in a very concentrated area in downtown Iowa City. The shopping district is more or less bordered by East Market Street to the North, East Burlington Street to the south. South Johnson Street to the East and the river to the west. The area within that square is filled with local, independent shops and boutiques offering everything from clothing to jewellery to books. The city is particularly famous for having one of the best bookstores in the country. Prairie Lights Book Store on Dubuque Street is so well regarded that it frequently hosts readings and signings by internationally acclaimed writers. In Iowa City, the University of Iowa Hawkeyes are the local team that everyone supports. As a NCAA Division I school in the Big-Ten Conference, the Hawkeye program is recognized as one of the best in the country. Football is by far the most popular sport, with the games being played at the 70,000 capacity Kinnick Stadium. The school has a long list of NFL players that have graduated from the program, including linebacker Chad Greenway, and hall of famer Andre Tippett. If you prefer to play rather than watch, the ample supply of golf courses in the area should make you happy. Pleasant Valley, Finkbine, and Hi point are just a few of the local options. If you're a hiker or enjoy biking, then the trials at the Terry Trueblood Recreational area should appeal to you. Some of the best trails in the city wind through the University. The longest trial is the six-mile long Iowa River Corridor. With river views all along the trail, it is also amongst the most scenic places to spend your time in the city. When you head just north of the city to the Hawkeye Wildlife Management Area, you have a truly great opportunity to enjoy nature in it's natural habitat. There are several campgrounds throughout Hawkeye, which allows many Iowa City residents to spend the weekend enjoying nature.